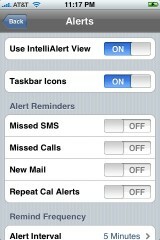 In the Alerts option, you can now choose to enable the IntelliAlert View. 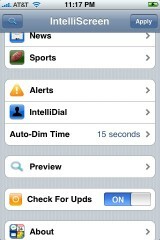 IntelliAlert View will display your alerts in a little peal-back menu on your lock screen. All of the Phone, Voicemail and Calendar alerts are moved to the peal-back menu and no longer display above InteliScreen. Another new option is the ability to turn on/off Repeat Cal Alerts. 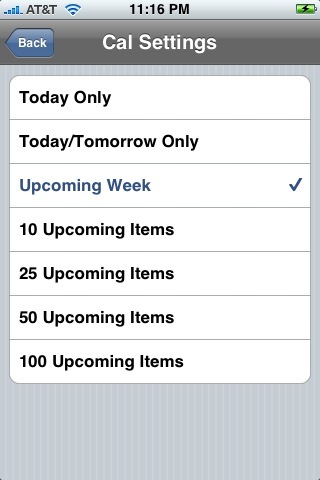 If you toggle Repeat Cal Alerts on, it will continue to alert you until it is acknowledged. 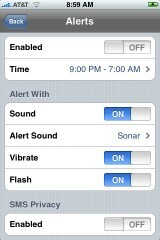 The final new feature in the Alerts option is the ability to turn on/off SMS Privacy. 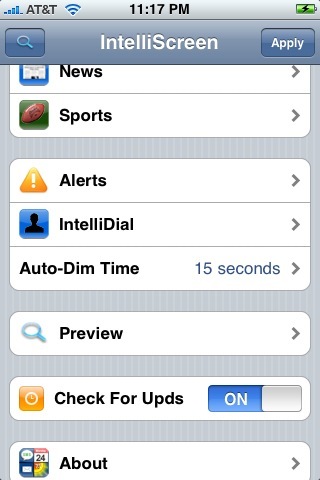 If you toggle it on, it will turn off the pop-up that is displayed when receiving a new Text Message. 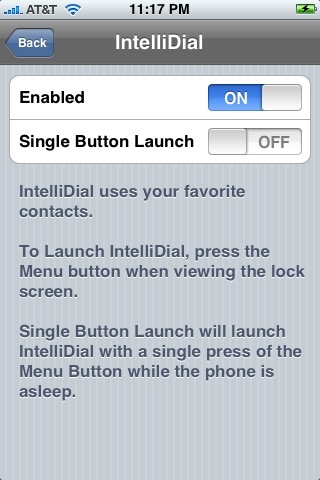 There is also a new feature called IntelliDial. IntelliDial is a feature that allows you to dial a contact from your Favorites list…right from your lock screen. All you have to do it tap your Home Button while on your lock screen, and it will bring up a Cover Flow style list of your contacts. If your contact does not have a image…it will add a stock image. Once you are on the contact you would like to call, double tap the image and it will automatically that that contact. 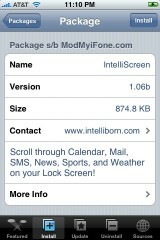 Below is a list of the bug fixes for version 1.06 of IntelliScreen. 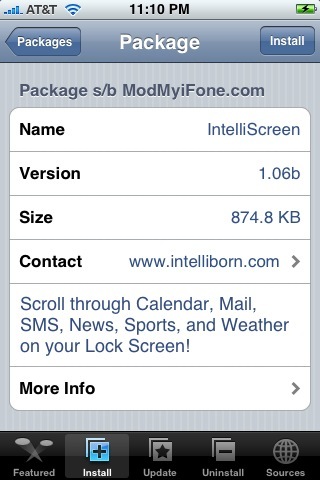 You can get IntelliScreen via the Intelliborn source. For me, it’s not installing. It says “Package download failed!”. Works fine now…no problems with installing anymore. Looks nice but screw ’em for taxing people (some whose phone was screwed up by their app) w/ their outrageous pricing. They should have given some of the users that had issues after they installed the software complimentary licenses or freakin discounts. What about the cost of the program??? the last new i had, was that intelliscreen wasn’t free anymore. I tried with itoday but i hated it!!! Gotta pay but there are two versions. The full is $19.99 while, I believe, the basic is about $5. I got the full version and totally think it’s worth it. $49.99 USD IntelliScreen 1.x Premium License – With 6 months Support = Too Much. yeah it´s really exspensive and it´s even illegal. For me I love it. Just the fact it has SMS privacy is enough. Iphone should have been able from the start to turn off the pop up display when you get a text. You can download iBlacklist for free and enable the SMS privacy, Call Privacy & Call Forward Privacy feature there. If this will work with 2.0, and there are no free comparable products, I may buy it down the road. 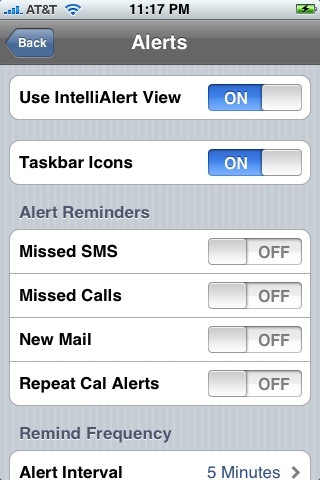 how do you view the intellialert alert view in the peal-back menu? This is still very unstable isn’t it? Brooke, is that your phone in the screenshots? If so, what happened to your custom carrier and the rest of your customized status bar? I was a non-believer, but as a business traveler, replacing a Treo with this phone, Intelliscreen has been incredible valuable to me. So much so, that I paid the $20. To be honest, i like this and some of the other apps so much, that Im gonna hold off buying a 3G iPhone until I know it’s unshackled so I can keep my apps…… like uSirius. Love it! 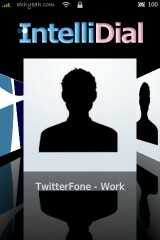 Is this app for the US only or does it have international support? Please let me know as i would love to try it. rebooted my phone after installing it and now it wont go past the apple boot screen. now what? I had this same problem. Ended up having to restore my iTouch as a completely new iPod, if I restored it to the backup in iTunes I kept having the same problem. 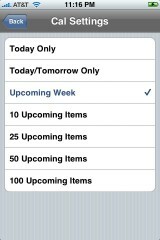 It’s a major bummer as I really liked this app, but I sync my bookmarks and that is more valuable to me than this app. If this gets fixed, somebody please let me know, because I would love to reinstall this app. I had the same exact problem Jonathan. It corrupted my backup. Luckily, I had just Timecapsule, so I was able to restore most of the important things through that. I will never install this app again, unless they make it stable. i wont be installing it again either. i dont think it would be smart to buy this right now. it would never be allowed in the appstore and there’s no assurance it will work with 2.0 if that gets jailbroken. Ya. You are totally right ! The older apps are not compatible with the 2.0 FW API. 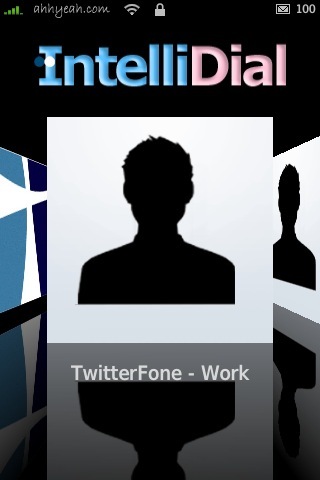 And besides, IntelliScreen runs a background process, so its not going to be on AppStore for sure ! What a total piece of dog$hit software. Why is this thing even marked as safe in the install if so many people like myself are forced to completely restore after this thing bricks your iPhone.